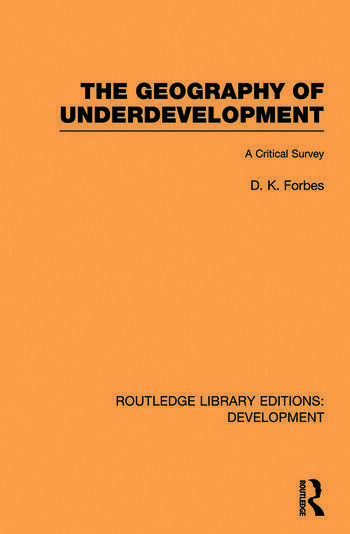 First published in 1984, this title discusses the emergence of both the orthodox and political economy based approaches to underdevelopment in geography , critically assessing their strengths and weaknesses, and showing the relationship between intellectual developments and changing material conditions. The work is primarily concerned with theories, though it does contain much empirical material drawn from throughout the Third World. The book examines the emergence of theories of development historically and considers the various contemporary theoretical ‘schools’, both Marxist and non-Marxist. It goes on to consider four aspects of development which are of particular interest to geographers, namely the world economy, regional imbalances, the human-nature theme and the analysis of urban space, and concludes by suggesting some directions for future research.